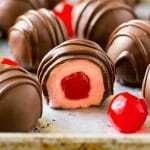 Chocolate covered cherries are one of my all time favorite candies, along with fudge and peppermint patties. These sweet treats make great holiday gifts, party favors, or a snack to satisfy any chocolate craving. My favorite candy store is See’s candy. And every time I go in there, I have to get chocolate covered cherries, they’re my all time favorite candy. This homemade version is actually easier to make than it looks, and they are SO delicious. Everyone will be so impressed that you made them yourself! How do you make chocolate covered cherries? The first step to making chocolate covered cherries is to make the fondant that goes around the cherries. The fondant is a combination of powdered sugar, butter and maraschino cherry juice, which forms a dough that can be wrapped around individual maraschino cherries. This dough can be a little sticky to work with. I recommend either coating your hands in cooking spray, or adding a little bit of powdered sugar to your work surface so that the dough doesn’t adhere to your hands or work space. It’s important to make sure the maraschino cherries are completely dry before you wrap them in fondant, otherwise the fondant will not stick. After the cherries are wrapped in fondant, they need to be chilled so that they’re completely firm before they get dipped in chocolate. Otherwise, your cherries might start to melt and lose their round shape. I use Ghirardelli Dark Melting Wafers to dip my cherries in. They melt beautifully, are really easy to work with, and create a shiny thin shell on the cherries. 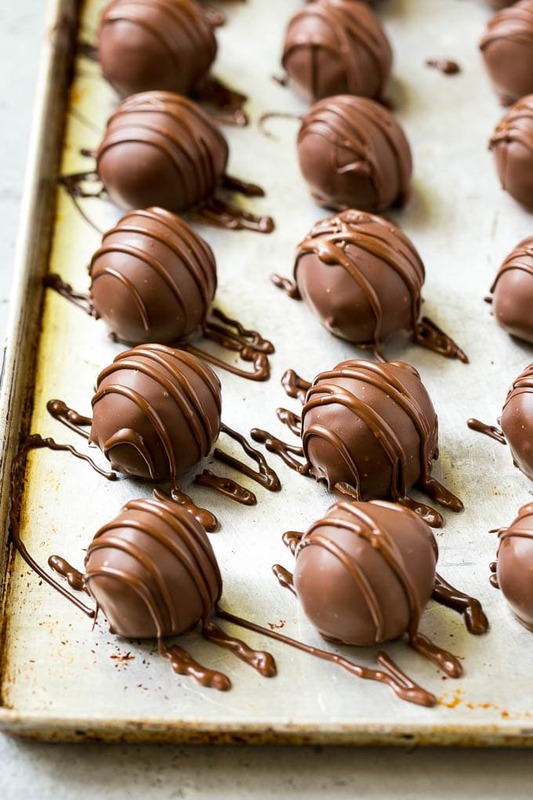 You can also use chocolate chips or another brand of candy melts, but you’ll likely have to add some shortening to thin the chocolate before you start dipping. These cherries are best stored at room temperature after dipping so that the centers stay soft. The centers will never fully liquefy, but they’ll be rich, creamy and delicious regardless. While I use dark chocolate for these cherries, you can also use milk chocolate if you prefer. 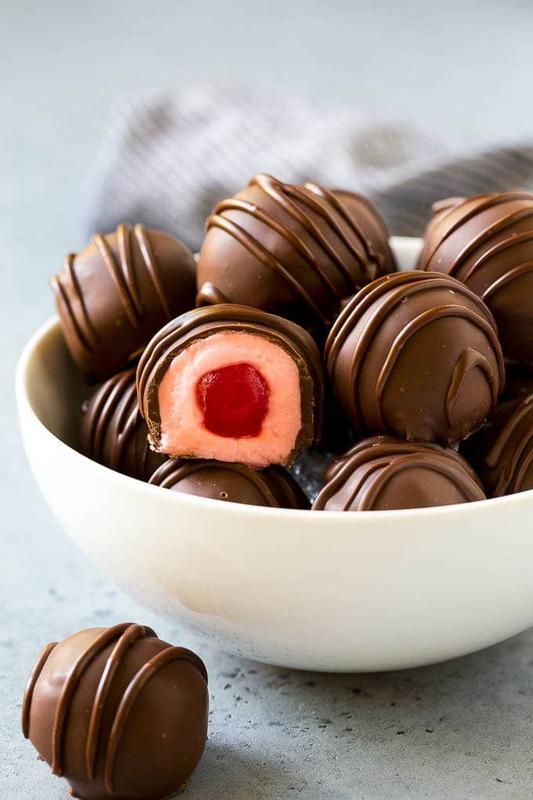 I personally like my chocolate covered cherries with the stems removed, but you can absolutely leave the stem on if you prefer, it does make for easier dipping! I love to package these chocolate covered cherries in little gift boxes around the holidays to give to family, friends and teachers. No one can believe that we made them ourselves, and I have to say, I think the homemade version is SO much better than store bought. 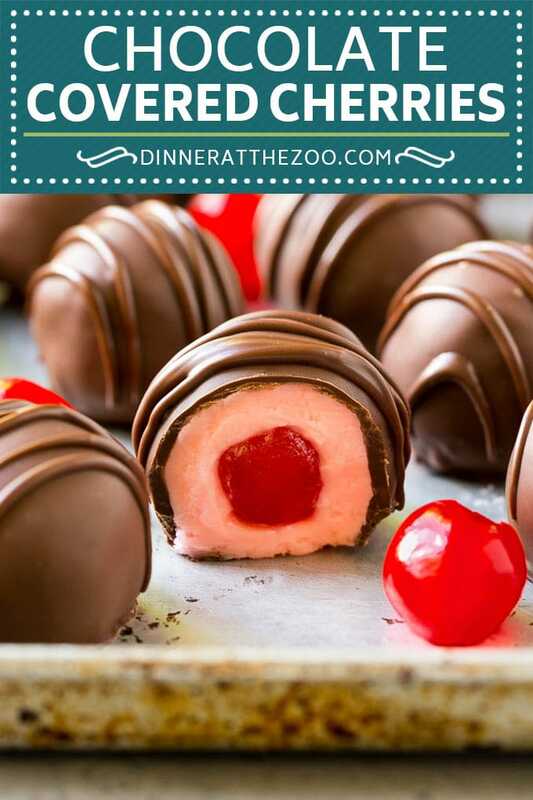 These chocolate covered cherries are made with maraschino cherries, a creamy center and plenty of dark chocolate. A homemade version of the classic treat that's impossible to resist! Drain the cherries, reserving 1/4 cup of the cherry juice. Place the cherries on paper towels and pat to dry. Place the powdered sugar, butter and 3 tablespoons of cherry juice in the bowl of a mixer; beat to combine until the mixture forms a dough. If the mixture seems too wet or sticky, add 1 tablespoon of powdered sugar at a time until desired consistency is reached. If mixture is too dry, add 1 teaspoon of cherry juice at a time until desired consistency is reached. Cover the bowl and refrigerate for 20 minutes. 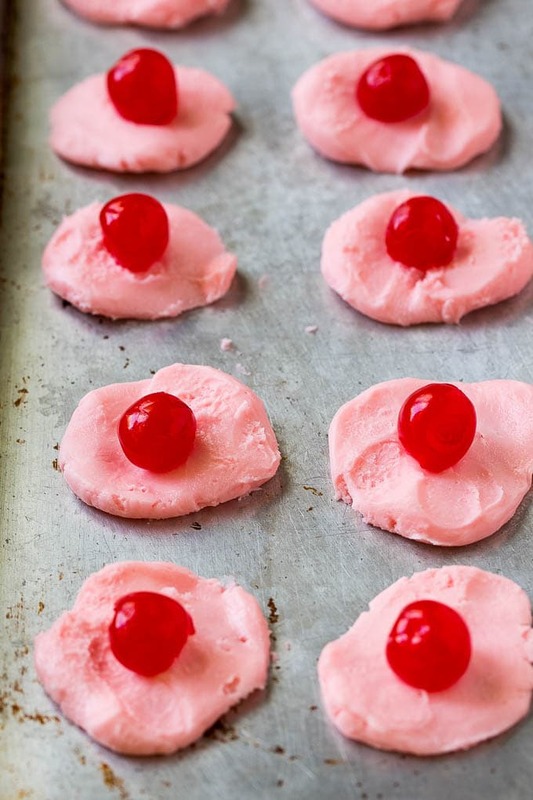 Take two teaspoons of the cherry dough and flatten it into a disc shape. Place one cherry onto each disc and wrap the dough around the cherry to form a ball. If the dough sticks to your hands, try coating your hands in cooking spray first. Place the balls onto a sheet pan lined with parchment paper and freeze for 20 minutes. While the balls are chilling, melt the candy melts by placing them in a microwave safe bowl and cooking them in the microwave for 30 second increments until melted. Stir the candy melts until smooth. Place one ball on a fork and use the fork to coat the ball in chocolate. Gently tap the fork against the side of the bowl to remove any excess chocolate. 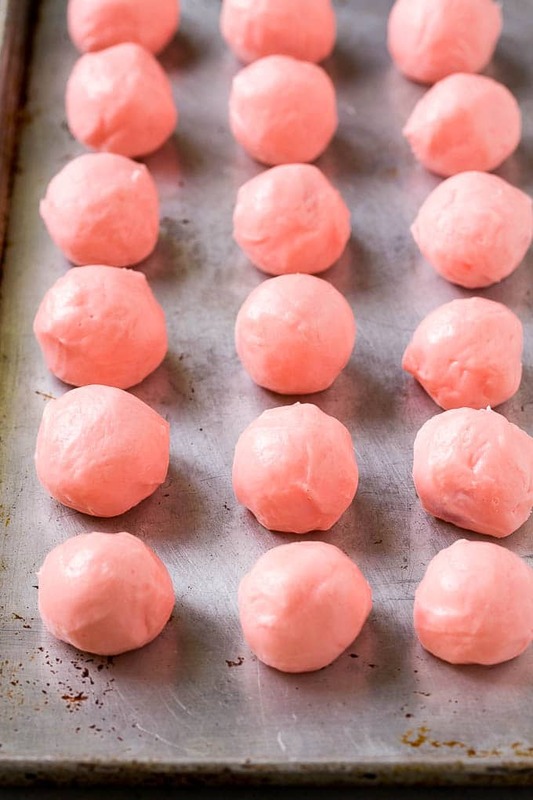 Place each dipped ball onto a sheet of parchment paper. Repeat the process with the remaining balls and candy melts. Place some of the melted candy in a resealable bag and snip off one corner of the bag to use as a piping bag. Use the piping bag to drizzle melted chocolate over the tops of the dipped cherries. Let the chocolate coating harden, then store the cherries at room temperature for up to one week. If you wanted to soak cherries in rum or vodka, would they get dry in order to be wrapped in fondant? You’d need to pat them dry with a paper towel! I just made them for Thanksgiving. Directions were excellent . Have not tasted but they sure look good. Happy Thanksgiving hope you enjoy! Chocolate + fruit = one of my favorite combinations. :] These look so good! I don’t think you understand how this recipe is supposed to work. This is a classic cherry cordial recipe. You make them a month or so in advance and leave them in tupperware lined with parchment/wax paper. over the 4 to 6 weeks storage the fondant breaks down and transforms into a syrup. So you end up with a cherry floating inside a little bite of syrup just like store bought. they are safe to store that long because of the large amount of sugar and lack of water to inhibit any bacterial growth. For added fun you can buy the cherries with stems and keep the stems on as you wrap and dip the chocolates, makes it even more fun. honestly eating them early is kinda disappointing compared to the end product. My understanding was that you needed to use invertase to liquify the sugar center, and since this is a recipe for home cooks I didn’t include that since it’s not the easiest to find. 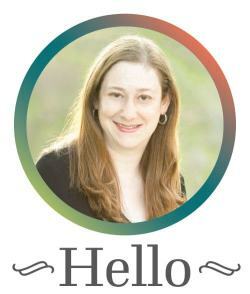 I will try making them your way and let you know how they come out! The pictures of your chocolate covered desserts are beautiful. Unfortunately, I grew up not liking sweets. My kids would love for me to make these though. Yay! Your new chocolate recipes screams Christmas and Valentine’s Day combined! I would be a happy lady receiving these as gifts. These look so delicious. I like the mix of chocolate, fondant and cherry. It provides a nice flavor profile. 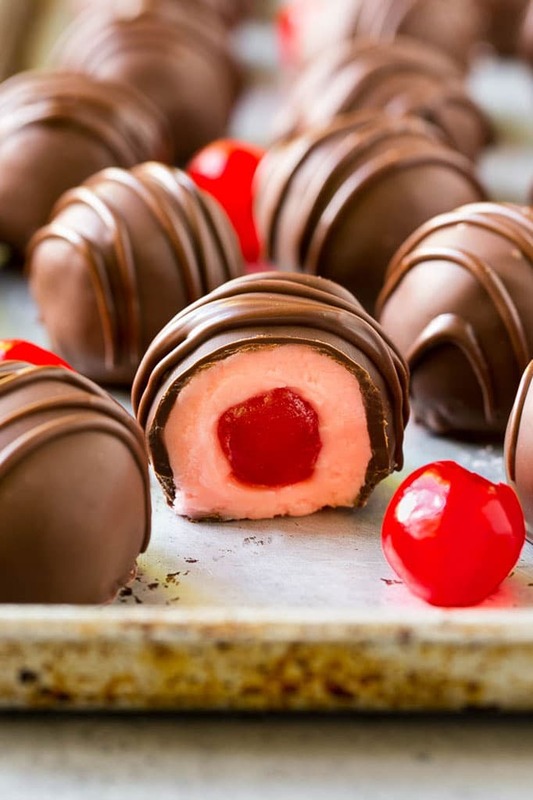 Oh my gosh, we love homemade chocolate covered cherries, but I haven’t made them in ages! I’ll be making these this holiday season for sure! These are great for Xmas season I am pretty sure. I can always pre-made them and then serve during the exact date. I love how pretty these little dessert look like and pink inside. I’m not always a huge fan of chocolate covered cherries. It had to be the right mix and proportions of chocolate to cherry for me! However, these look so good! I’ll definitely have to give them a try, thanks for sharing! I made these for our son who likes chocolate covered cherries. My Dad loved them too. My husband or I neither one have ever cared for chocolate covered cherries, but these are COMPLETELY different than the store candies. There is no way to describe how good they are. AMAZING!